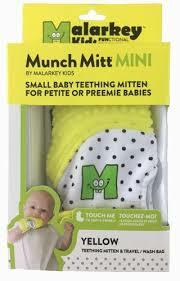 The Munch Mitt Teether is a handy teething solution that prevents the constant dropping of teething toys. 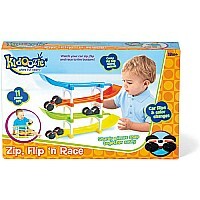 Convenient for parents and for travel in the stroller or car seat. Comes with a washable travel bag. 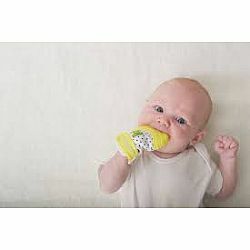 Protects baby's hands from excess saliva and chewing. 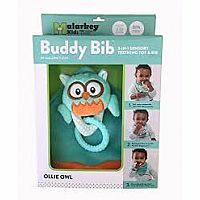 Designed for babies 3 months to 12 months. 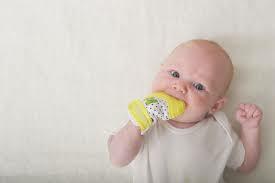 Suggested use is from 3 months to 8 months or until they are able to remove the mitt themselves. 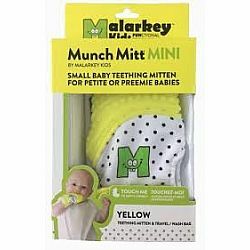 Brand: Malarkey Kids - Munch Mitt.